Now back in print, after decades, Norwegian Knitting Designs holds a wealth of traditional Norwegian knitting charts. Author Annichen Sibbern Bøhn travelled the Norwegian countryside, collected folk patterns that early 20th century modernization was quickly leaving behind, and in 1929, published them in a slim yet vibrant volume that nearly single-handedly saved this tradition from the ragpile of history. Norwegian Knitting Designs provides a rich library of charted patterns for knitters, needleworkers, and craftspeople of all kinds. The new publication contains all of the charts from Norwegian and English editions, plus two sweater and one cap patterns, in their original form. This edition is sure to inspire today's craftspeople and designers to use the old designs in their new creations. Editor Terri Shea, author of "Selbuvotter: Biography of a Knitting Tradition" has added tips on substituting charts into existing patterns and designing new projects using the symbolic meanings of folk (and modern) motifs as a leaping-off point to guide today's artists creativity. 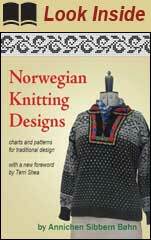 Norwegian Knitting Designs is available for pre-order now, and will ship as soon as it is off the presses. Retailers, contact us to establish a wholesale account, or ask your distributor to carry it.